Printed broadside in Hebrew and Arabic. Endorsed by R. Shabthai Bohbut, Chief Rabbi of Lebanon. Folio. Bibliographically unrecorded. 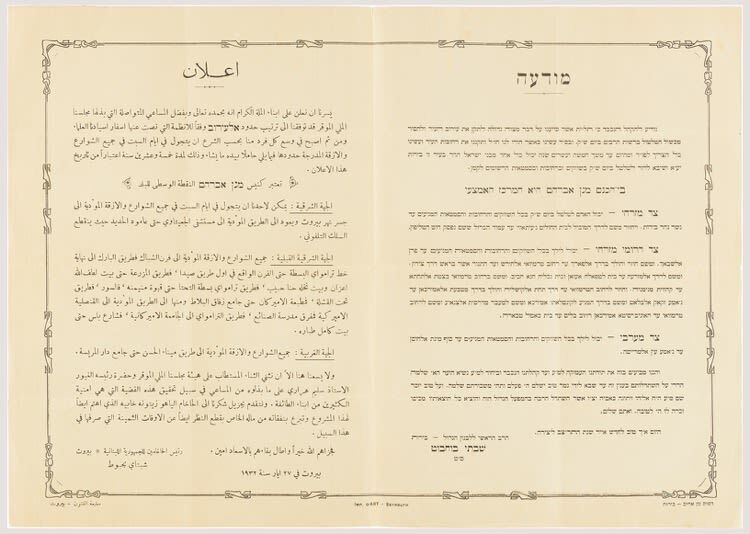 Concerning the establishment of an Eruv in the city of Beirut, which allowed Orthodox Jews on the Sabbath to carry while walking through the various streets and market places as enumerated in this announcement. The Eruv boundary extended from the Maghen Abraham Synagogue, which was located in the Jewish district of Wadi Abu Jamil, in central Beirut. Maghen Abraham was constructed in 1925 and named for Moise Abraham Sassoon of Calcutta. Heavily damaged during the Lebanese civil war, the synagogue was left derelict while the Jewish community practically dwindled into non-existence. A renovation project has been in development in fits and starts in recent years. Born in Jaffa, R. Shabthai b. Solomon Bohbout (1870-1948) was Rabbi in Aleppo before being called to serve the pulpit in Beirut. He remained there until his death.